Relationship building is one of the keys to public relations, and by being a reliable source for media, LCWA has been able to create a meaningful relationship at the TODAY Show. We were able to secure three clients on TODAY for a total of six segments throughout the first quarter of 2016! 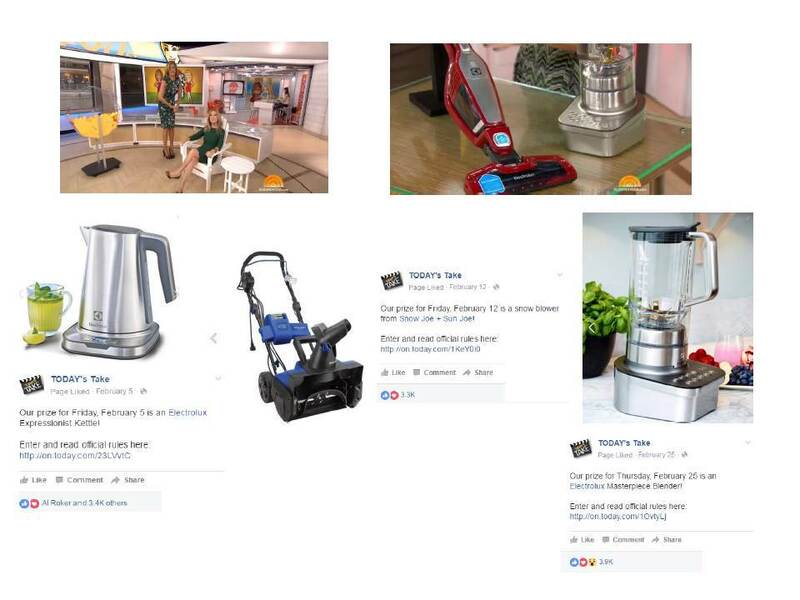 To assist TODAY’s Take launch their new Facebook page, LCWA promoted their page as part of their “25 Days of Giveaways” with a giveaway of an Electrolux Expressionist Kettle, Electrolux Masterpiece Blender and a Snow Joe iON Hybrid Snow Blower. In the initial segment, the Snow Joe iON Hybrid was even specifically called out by Al Roker! Each giveaway was subsequently promoted on the new Facebook page in addition to a shout out during the third hour of TODAY. Additionally, the LCWA team secured and coordinated two spots on the TODAY Show with Kathie Lee & Hoda for their “Give It Away” Sweepstakes. Trex Outdoor Furniture provided a beautiful appearance on set with a giveaway of an Adirondack chair and side table to five lucky viewers to help prep for spring with some new outdoor furniture made from recycled materials – including plastic milk jugs and laundry detergent bottles. Electrolux was able to upgrade appliances with an Ergorapido Ion Brushroll Clean Xtra and a Masterpiece Blender, providing a stylish 2-in-1 vacuum and a hi-tech blender to five individuals. Through a mutually beneficial relationship with TODAY, these opportunities established great content for our clients and all six segments in total reached more than 18.8 million impressions, and many new Electrolux, Trex and Snow Joe owners as well!